My son’s class had an activity in which they had paper taped to their backs. 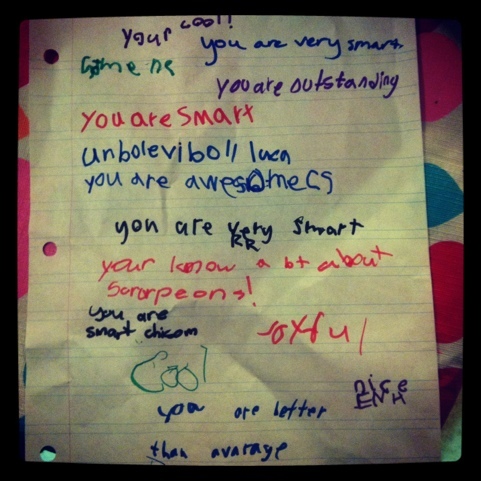 Their classmates had to write something positive about that person, my favorite was the kid that said my son was “better than average.” It makes me smile every time I look at it, I may frame it so when he asks what he was like as a child I can point it out and honestly say he was better than average. This entry was posted in Instagram, Project 366 and tagged funny, Instagram, kids, photograph, project 366, school. Bookmark the permalink.